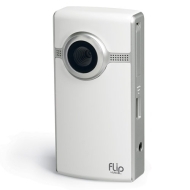 alaTest has collected and analyzed 11 reviews of Flip Video Ultra Series 120 Minutes Camcorder, Black. The average rating for this product is 3.9/5, compared to an average rating of 4.0/5 for other Camcorders for all reviews. People really like the usability, whereas some have doubts about the durability and price. We analyzed user and expert ratings, product age and more factors. Compared to other Camcorders the Flip Video Ultra Series 120 Minutes Camcorder, Black is awarded an overall alaScore™ of 78/100 = Good quality. Only lasted 9 months before it died. Bought two of these for our kids, and they are enjoying using them. Easy to use for our 7 and 11 year olds. Awesome Deal!!! Bought for Christmas and ran perfectly right out of the box. Recorded some great memories already and I've only had it for two weeks. Easy computer software built in also. I knew going in that the pixel density was relatively low. Since I use it to record individual athletic performance (I am a crew coach, golfer and tennis player) a little graininess at large screen size does not bother me.